Knowing how much RAM you have and the overall specs of your Windows 10 PC is very important. For example, many programs require your computer to meet a certain criteria of specifications in order to use them properly. For example, a program like Adobe Photoshop CC requires at least 2 Gigabytes of RAM. If your PC falls short of that, you might experience extreme slowness while using the program. 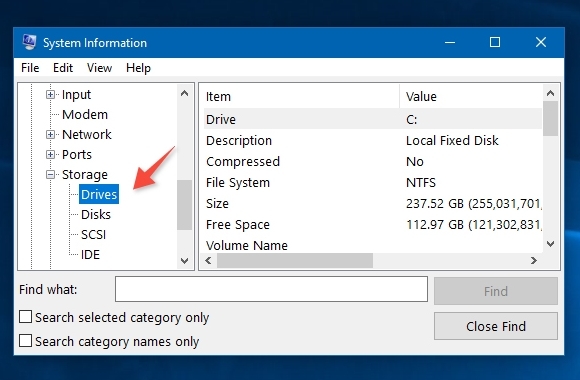 In this quick guide, you will learn how to easily check how much RAM you have and the system specifications on Windows 10. Go to the bottom-left corner of the screen and type System Information. Click System Information from the search results. Click System Summary to see RAM, Processor and other specs. Scroll down and click Drives to see how much storage you left. Each Drive is assigned a letter. In this case, Drive C has 112 gigabytes of free space.